While Barcelona and the Costa Brava provide many a visitor to Spain with more than enough to fill a vacation, historical Girona, only half an hour away from Barcelona by high-speed train, is worth a day trip for anyone, but, most of all, for Game of Thrones fans. The location scouts for Season 6 lucked out with Girona, using it to play three of Game of Thrones’ major cities: Braavos, Oldtown and King’s Landing, (after relocating) The Sept of Baelor from Fort Maoel in Malta and the rest of King’s Landing from Dubrovnik in Croatia. Had you visited in late summer 2015, you might have spotted Jamie Lannister, the Tyrell siblings, Arya Stark, The High Sparrow and Samwell Tarly. Here’s where they were and a few places you might want to pause on your tour to eat and drink. 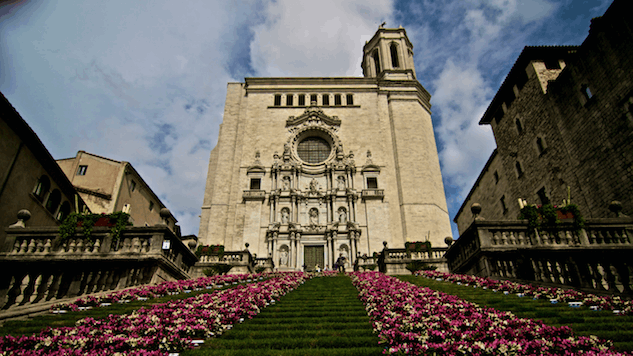 Girona Cathedral is one of the most visited tourist spots in town, so, even if you weren’t following in Jamie Lannister’s steps, you’d probably have ended up here anyway. With a drink and snack on the terrace of Café l’Arc on the corner of the Plaça de la Catedrale, to your right you can see the steps Jamie spurs his horse up to confront the High Sparrow in front of the Sept. Straight ahead and you’re looking through the archway onto Pujada del Rei Marti where he and his troops enter the square intent on preventing Margaery’s Walk of Atonement. From the top of the Cathedral steps, your view is quite different from Margaery’s though. The hill sloping down towards the sea was all CGI as Girona’s nearest coast is about 40 minutes away. Before Arya Stark and The Waif are sworn enemies, and The Waif just dishes out brutal training sessions to the blind beggar Arya, they meet in Carrer del Bisbe Josep Cartaña, a wide street near the French Gardens behind the Cathedral that curves around level with the towers. Arya didn’t make it this far, but if you fancy a drink, a couple of streets away on Plaça Sant Domènec is Bar Campus, a student hangout next to the university with a fairly quiet, leafy terrace at the foot of the convent of Sant Domènec. Take the steps down and you’ll be on the same path as Arya when things get even nastier with The Waif. Fleeing for her life after The Waif stabs her, Arya doesn’t have time to stop for lunch but, if you’re tracing her panicked footsteps and feel peckish, you’ll find restaurant Le Bistrot right about where Arya jumps onto the barrow of oranges. Reserve a table outside on Pujada Sant Domènec, the long medieval staircase overlooked by Sant Marti Sacosta church which features the turquoise door you can see in the chase sequence. Otherwise, the restaurant is spacious enough inside, with an inexpensive menu del dia and a range of pizzas. Closed on weekends. Another street used in this sequence, though harder to spot, is Carrer Sant Llorenc, a narrow cobbled alley leading off from Carrer de la Força on your way to or from the Cathedral. As well as being THE souvenir shopping street, Carrer de la Força is where you’ll find locals and tourists alike indulging in their first alcoholic drink of the day – vermut (vermouth) at El Vermutet. Traditionally served with salty snacks of olives and anchovies, vermut is part of the Catalan Sunday morning ritual known as “fer un vermut” (do a vermouth). Think of it like having a mimosa with brunch – but with a less substantial meal to soak up the 15% alcohol. Alternatively, do this part of your Game of Thrones tour in the afternoon and stop by Martina’s Sweetcakes for cupcakes. The Monastery of Sant Pere Galligants boasts the only interior location in Girona to be used in the filming and brings Samwell, Gilly and the baby to the Maesters’ Citadel as Girona becomes Oldtown. You too can tiptoe into the slightly intimidating space during opening hours (varying according to day and season but always closed on Mondays). The exterior wasn’t used but you can linger a while at 18th-century restaurant, La Taverna de l’Abat, on the corner opposite for lunch or tapas or, if you totally miss the opening times, spend the evening drinking cocktails at Nykteri’s cocktail bar instead. Both places are closed Mondays and Tuesdays. Though this side of town wasn’t on any of the filming schedules, you’ll definitely want to cross the river for ice-cream on your own Game of Thrones tour. Ice cream parlor Rocambolesc is run by dessert chef Jordi Roca, one of the chefs from 2013 and 2015’s World’s Best Restaurant, El Cellar Can Roca. As well as ice-cream, the shop offers a selection of popsicles inspired by features of Spain and the local area – plus geeky homages to Star Wars and, of course, Game of Thrones, with a blood orange and mango popsicle shaped like Jamie Lannister’s golden hand. Locations also worth checking out are the Arab baths, which Arya blunders into on her escape from the Waif, and Plaça Jurats where the theatre scenes were filmed. But bring your own refreshments for these sites because, as yet, no cafés have sprung up on the surrounding, almost untouched, windy streets. Lose yourself in the streets around the nearby German Gardens and you’ll feel like you’re in a Game of Thrones scene at every corner. Nicola Prentis writes fiction and materials for English teaching. Teaching took her all round the world trying different cuisines, including a spell as restaurant critic in Istanbul. Her treasured Vermont cookbook features heavily in her cooking. Follow her @NicolaPrentis.